cohesion and comprehension. For the sake of the storyline." Put your dimple down. Now you know." Musical "Merrily We Roll Along." 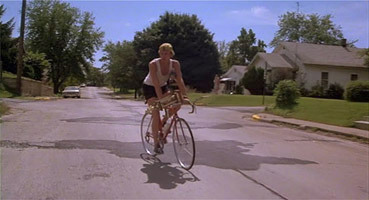 I have been preparing to review the sublime Breaking Away for a fortnight now. This task should not have been seen as any effort at all and yet curiously the words didn't come easily. Every time I see one of its terrific scenes, I want to write about it. Problem is, there are so many scenes and every single one in this polished gem of a film is worth commenting on; option paralysis as Douglas Coupland would say. So I thought I'd go after it in broad thematic terms. Breaking Away is many things. It's a sports movie, a coming of age tale, a romance, a comedy, a deft and assured look at the American class structure, a beautifully constructed character piece, a treatise on the powerlessness of the human condition against the grit of time. This film has everything, is everything (Hollywood-wise that is, let's not get too far ahead of ourselves) and that's damn hard to write about except this part. If you haven't seen it (and it has only now, thirty-one years after it was theatrically released, made it on to a Region 2 DVD – bravo, Second Sight) please treat yourself. It will be ninety-seven minutes of pure pleasure despite this disc's one true set back, the state of the film itself (see Sound and Vision a little later on). Director Peter Yates will probably be remembered for the classic laconic cop movie Bullitt and its justifiably famous car chase. But for me, he will always be the guy who brought Bloomington, Indiana to cinematic life and celebrated the emotional hinterland of four nineteen year olds who went on to prove that we are more than the sum of our pasts. Let's also give a nod to fellow outsider (director Yates is a Brit) and Oscar winner for his efforts, screenwriter Steve Tesich from whose original story the movie is taken. Despite the fact that almost every American is an immigrant by definition, it strikes me as oddly significant that a Brit and a Serbian American have delivered the United States on screen as, one imagines, it really wants to be portrayed. It's not too sweet, nor too sour. It's wholesome in the correct sense; nourishing, honest and healthy. This is a movie other movies would make best friends with. By accident or design (I suspect a curious mixture of both) this film came to speak personally to me as the epitome of what goes through your late teenage mind as you are squeezed, soap-from-fist-like, out of adolescence into maturity. So now I'm a grown up. What do I do? At forty-nine, I still ask that question. Each of the four boys has been entertainingly and vividly brought to life. If any movie adage was proved by this genuinely charming film, it's that most of the work is done if the film has been cast right. Take a bow, casting directors Jane Feinberg and Mike Fenton. There's not a wrong note in any of the characters and interacting together they are an intricate and precise joy. All four are on the cusp of adulthood and all four have issues relating to how they see themselves as grown ups. One is an humour-centric loser whose father takes comfort in his own son's inadequacies. This was Daniel Stern's movie debut as Cyril. The second comes from a broken home who thinks marriage will make him 'grown up' (and he expects his bride to pay for the marriage licence). Take a bow Jackie Earle Haley (as Moocher) currently reprising Freddy in the Nightmare remake (and let's not forget his terrifying Rorschach in Watchmen). The third is an ex-jock put to shame by the never-ending supply of youthful bodies that course through his hometown by way of a large university campus. Have many more actors been more dependable than Dennis Quaid? His Mike here has just the right amount of bitter bravado. Your sympathies are with him but you also accept his faults. I have a special regard for Mr. Quaid as he once bummed a cigarette from me in 1982 while filming The Right Stuff. I do not make this stuff up. It's a safe bet he wouldn't remember that. And what about the fourth, Dave Stoller, played winningly by Dennis Christopher? He's a dreamer who idolises the Italian racing cycle team, a previously pasty, unhealthy boy whose passion for cycling tapped into a reserve of stamina and skill he's now revelling in. The problem for all four is time and its relentless effect of 'adultising' each, forcing them into new areas of responsibility that none of them want to face up to. They have each other and at nineteen, that seems to be enough. One by one, they do face their fears and each blooms given their biggest obstacle – levelling the playing field. The college (aka rich) students are slumming it in this working class town while the 'townies' ('cutters', named after the nickname for those in the local industry of stone cutting) helplessly watch as if having been invaded by an army significantly better equipped than them. It is an invasion, however non violent. This is what passes for class warfare in the US, the campus-haves versus the cutter-have-nots. When I was a boy my parents bought me a second hand racing bike. I didn't understand the science in the 'U-on-their-sides' handlebars (and thought what idiot makes a cyclist so uncomfortable?) but went with it because it was "...what 'they' rode..." (the professionals). Imagine my surprise when told by a peer that Campagnolo was a superior brand of Italian cogged gear manufacturers, the very label on my own gears. 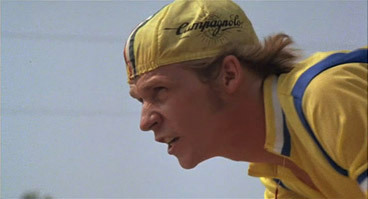 The hero of Breaking Away wears a same-branded hat in some of the cycling scenes. It was the first time in my life I was brand-aware (with an unreasonable desire for an Adidas three-striped red tracksuit coming a close second). Suddenly my bike was hip. I then experienced an extraordinarily painful crash into a wall that hurled me skywards and I dropped down akimbo on the horizontal bar (the resulting groin-based bruise looked like a David Cameron-faced birthmark). I eased up on the cycling but I lasted long enough in the saddle to understand the mindset of those who find exhilaration and challenges on the roads and tracks. Not only has Dave Stoller the mindset of a committed competitive cyclist, he also has adopted the culture of his heroes, the Italian Team Cinzano. Much to his father's very American irritation, he becomes Italian and woos a college beauty already involved with the movie's principal 'bad guy', the rich, handsome and physically able Rod, played with requisite smarm (and redeemed by a sense of reluctant fair play at the end) by Hart Bochner. Of course, Dave's fantasies of Italian identity will come around and bite him hard but for now, he serenades the girl, makes excellent time on his practise runs and life is fine. Every family scene is a joy and both Barbara Barrie and Paul Dooley play Dave's parents with a resigned irony and faux-irritation and frustration that their son will not amount to anything. When Dave 'gets' that 'everybody cheats' and hugs his father while his mother's eyes glisten, I get seriously tearful. But it's a throwaway moment but then how many movies have such moving throwaway moments? Marvellous! The scene of Stoller 'racing' an HGV (carrying what else but supplies of Cinzano) is an unalloyed joy. I remember having a discussion about why that scene worked so well. The opposing debate was all in favour of "It's the score... the music works without the pictures." But no, the sight of Stoller striving to hit each ten-mile an hour higher speed with help from an obliging lorry driver, a sequence itself driven by an adaptation of Mendelssohn's Italian Symphony, is cinematic gold. Yes, it's the music but it's also the pictures. Yates (and his editor, the now widow of Jaws' lead Roy Scheider, Cynthia) chose to leave shots long to maximize their effect and nowhere is that more evident in the final shot of the big climactic race. We see someone really competing with no cutaways in a shot that lasts well over a minute. What other movie would spare you cuts in the climax of the action? This was bold, and by today's standards, positively radical. Did I mention that there's not a bum line in the entire movie? The film showcases several characters with some terrific stand-alone quotes. It's not my job to just throw those lines at you but trust me, you'll smile at every fifth line in this glorious movie. Breaking Away is a small movie with an enormous reservoir of warmth, wit, character and excitement. Sometimes little movies make big impressions. What happens when a great 'coming of age' movie collides with one's own coming of age? The answer is serious cinematic joy and one of the best examples of Hollywood getting things so right. Until I did a bit of research, I was convinced the movie was a financial failure but what's this? A TV show spin off (not a success). Obviously the movie did some business. As far as I know only Joss Whedon gets to make TV shows from failed movies (and sort of vice versa as far as Firefly/Serenity is concerned). This DVD release has been in the Region 2 waiting room so long, it's a wonder it got a distributor's appointment. Aside from one technical reason I'm so very glad it did. Quite cheap you know. A real bargain. I carry this with me all the time. Some day there'll be a new girl at the A&P and when I want to cash a cheque, she'll ask me for my identification and I'll take out my passport and I'll say "Here!" Dave then agrees to race... My problem is that I have no idea what this scene means and would appreciate someone telling me. The writer Tesich sadly died in 1996 so no help there. And here I must bring the actual movie plaudits to a hasty narrow tyre-screeching stop. The print or standard definition tape source that this DVD is mastered from is dirty and extraordinarily grainy. And the digital artefacts aren't just noticeable, they seem to be mandatory in every scene. The master from which this transfer has been taken cannot be anywhere near the 35mm original negative which is a great, great shame. It's an anamorphic 16:9 transfer but the DVD quality betrays the paucity of the master source. It's like viewing a treasured possession through gauze – not good. Scratched to hell and back, this 4:3 trailer is of its time and if you've seen the film beforehand, it gives a lot away once you know what scenes you're looking at. Breaking Away is not an easy movie to sell to anyone (no stars, no special effects, no big budget story) but it's only after you've tasted it can you wholeheartedly recommend it to others. It's my hope that a few of you reading this will take a chance on it. You will be rewarded. An old friend with a shabby DVD coat. Such a shame. But if there's a DVD, can a Blu-Ray be too far behind? Please (technical providers) hunt out the 35mm neg or an inter-positive at the very least. This movie can scrub up as well as any other. Give it some love and attention next time at bat. Thank you.